Here we are at Week 6 and the end of this edition of the One Room Challenge for this season! I cannot believe that in 6 short weeks we have gone from a 1970’s relic (with one good wall and an upgrade that never got completed) to a beautiful space with a vintage feel in glorious blue and white! 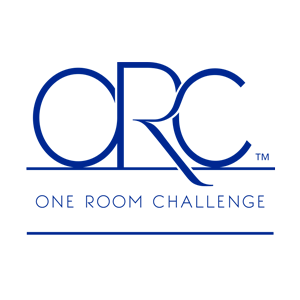 If you have somehow wandered by and aren’t familiar with the One Room Challenge (Welcome!! Please feel free to wander around and visit!!) it is an online community design challenge where designers and passionate DIY’ers gather and blog about our experiences, highs and lows of design and renovation while re-doing a room or space in 6 short weeks! And, believe me, 6 weeks is very short! Linda Weinstein from Calling it Home.com conceived this as a way of having support and encouragement during renovations and design projects and we are now in the 14th season! After you have taken a look at my room reveal, I hope that you will go back to Oneroomchallenge.com and see all the design inspiration on offer from all around the world! Many talented people have participated and done some fabulous work for you to see!! Here is a reminder of what we began with 6 short weeks ago…. This shows the fabulous 70’s fiberglass tub and shower surround, the sheet vinyl floor, and the general all-around uninspiring space! 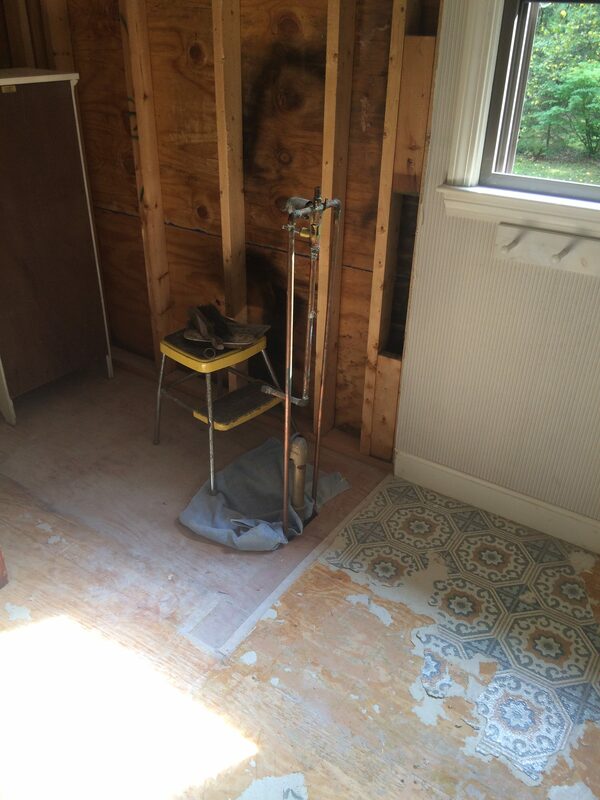 And after some relaxing, and satisfying demolition with assistance from my son…we had a “clean” slate…. About 8 years ago, I had started to do a renovation/general spruce-up , with the idea of installing a vintage bath with antique clawfoot tub, black and white hex tile floor, carrara marble counter and crisp white sinks to replace the harvest gold sinks with builder plastic crystal knob taps. 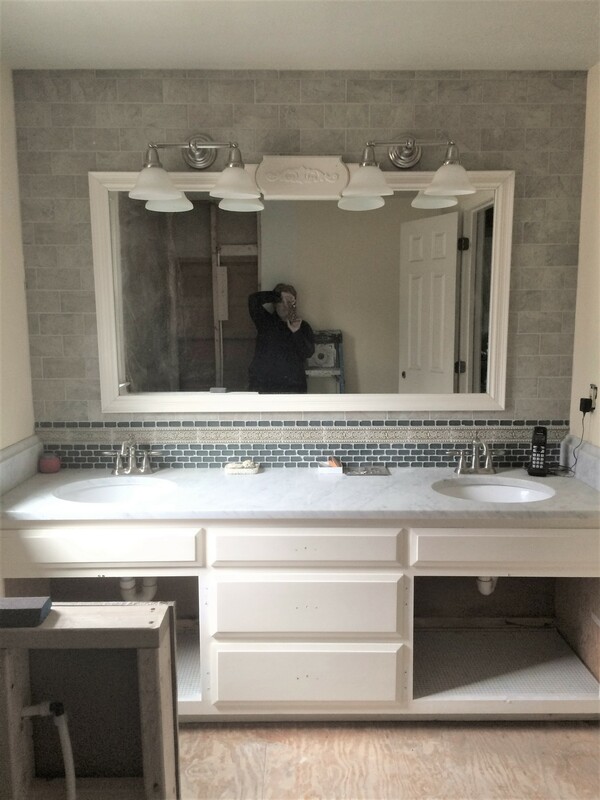 I installed the counter and sinks, new lighting, paint and vanity hardware and had my one wall complete with the idea that I would tackle the rest of the room the following year……unfortunately, that’s where we stayed until the One Room Challenge this season! This is my 4th season of participating, 2 times previously with client rooms, and in Spring 2015 I re-did my Family Room, Laundry and Powder room. Each time I am so energized and excited to get a room completed, that I knew it was the best way to finally take care of this long neglected room! I have detailed the issues with discontinued tile options, installation delays and difficulty scheduling and I am still working on a few things before the room is truly complete, but I wanted to share where we are as of today. It is a serious anti-climax, but the rest is scheduled to be complete by next week…so let this be considered a 2-step final reveal! 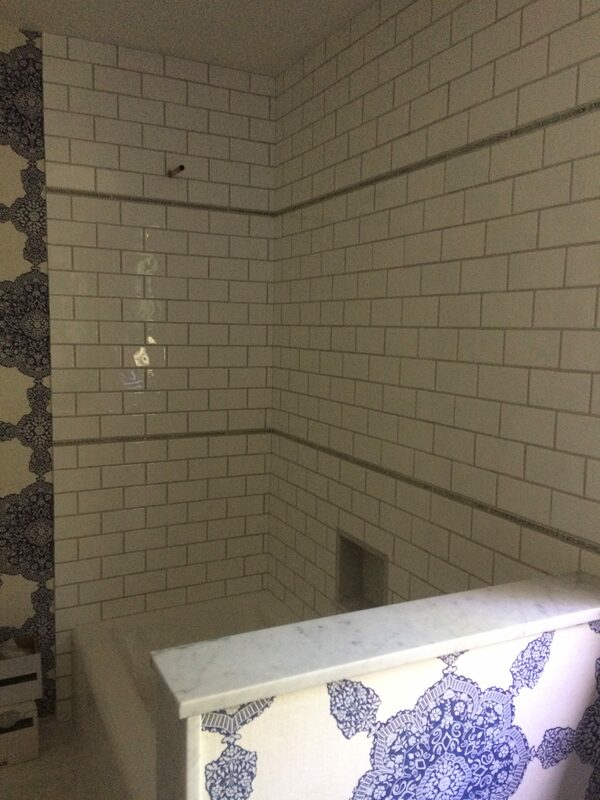 I am so grateful for my wonderful local Artistic Tile and my terrific tile installer for getting me on the schedule immediately after the tile came in from England! 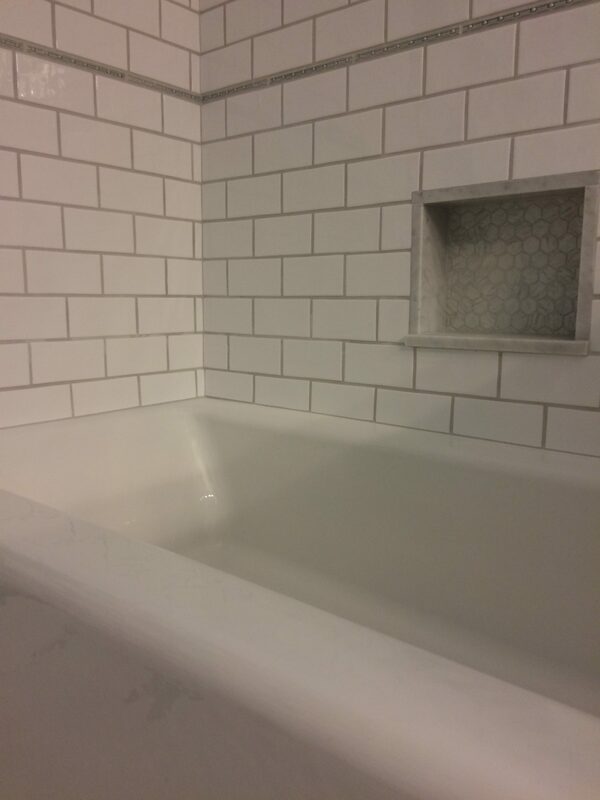 Installing the special “Widi” waterproofing system, 2 whole walls of subway tile for the tub, and then a patterned hex tile floor took many, many hours and it all came out beautifully!! I had her cap the tub end half wall with carrara marble pieces, as well as the custom niche, and it really gives the classic feel and look I was hoping for. 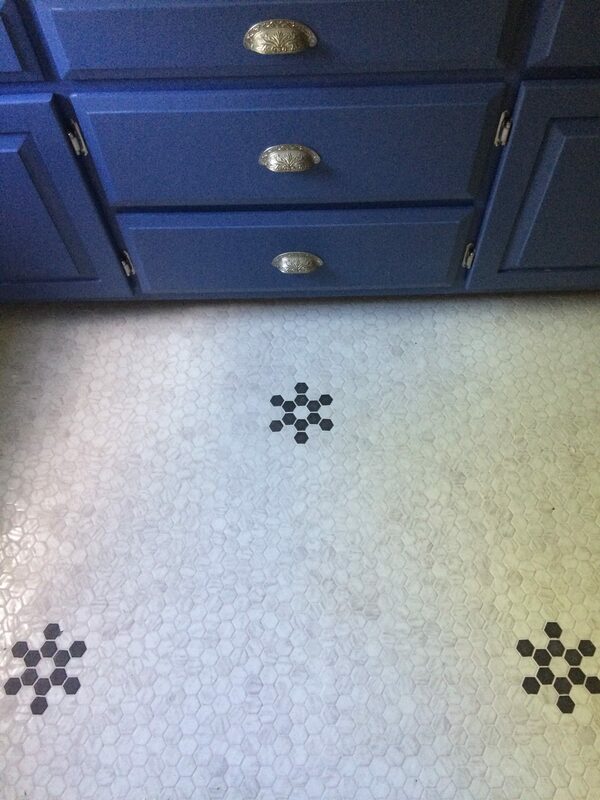 The subway tile and the hex tile floor are absolutely gorgeous and add to the classic vintage feel. The hex floor is a modern take on hex tile from Daltile and it is actually made from glass! It also has a non-skid surface which is ideal for a busy bathroom. Widi system up and preparing to tile! 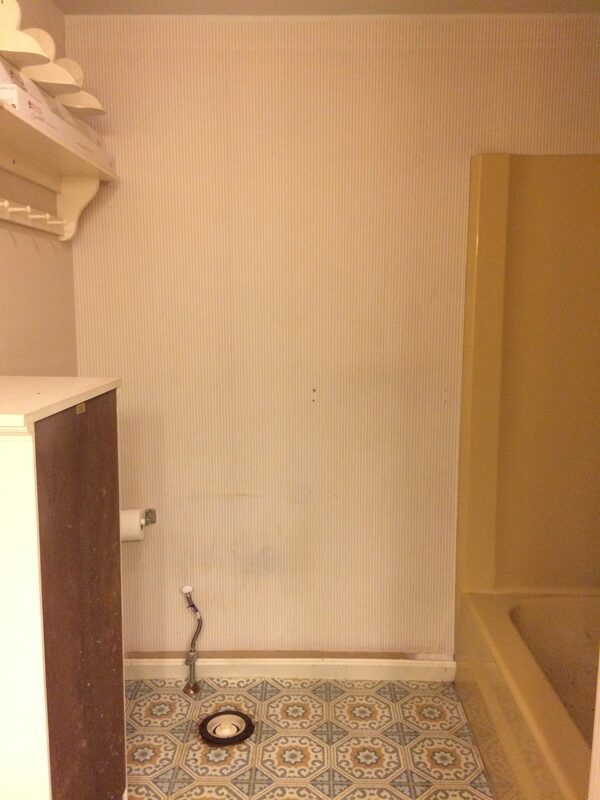 I tried to anticipate several potential issues when designing the features of this bathroom. First, I wanted to appeal to a wide variety of potential homeowners, those with young children and/or elderly family members. The tub I chose has low sides and is cast iron, still able to be easily accessed by Moms and Dads bathing young children, but also practical for a nice soaking bath, or a long hot shower. I have planned a sturdy grab bar for safety and convenience. 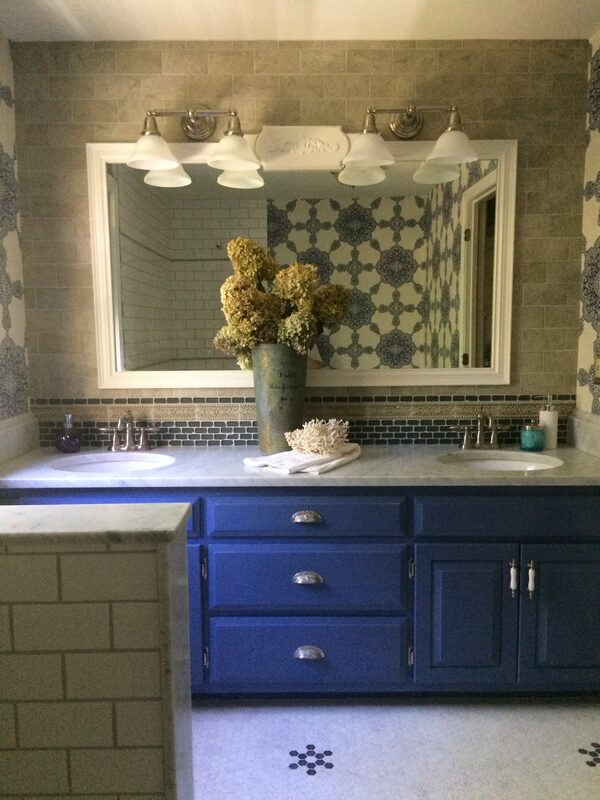 The original site-built vanity had plenty of storage so I wanted to retain that- so a fresh coat of paint and new hardware give it a nice refresh with Farrow and Ball’s super Estate Eggshell in Pitch Blue, a brighter cobalt blue. It looks super with the decorative hardware I had from the last re-do. I asked for people’s vote on the wallpapers I was deciding between- it was installed yesterday and this one was the overwhelming favorite, as well as my own! You can see glimpses of it in the rest of the photos. 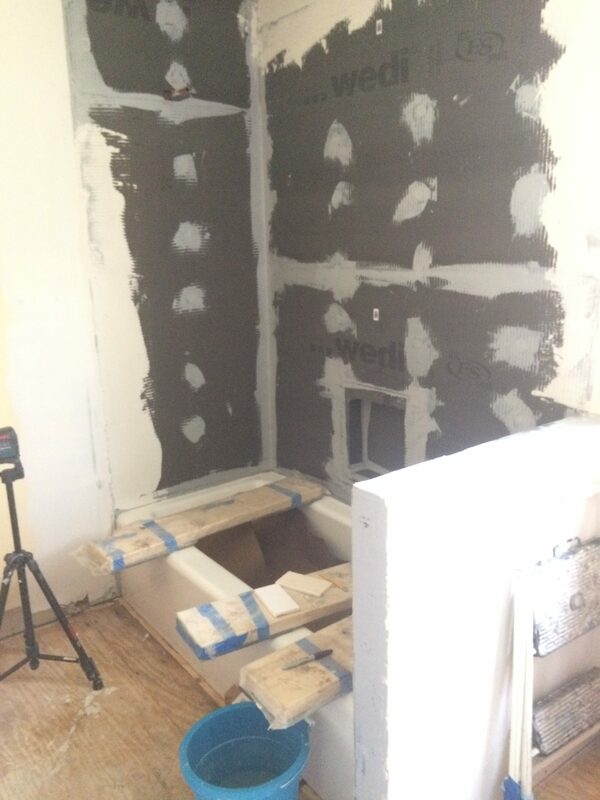 I hope you will get a chance to visit next week when the bathroom will be truly complete and the tub and shower fixtures will be installed, as well as the baseboard and new toilet! I can’t use the bathroom until those items are complete, so I am as anxious to get it finished for ME as well as show everyone the complete One Room Challenge! Be sure and visit the fabulous reveals of the Featured Designers, especially local designers, Linda Holt and Kelly Rogers, who absolutely knocked their rooms out of the park!! I LOVE following everyone’s progress and I had several favorites, but I know Linda and Kelly personally, and it is extra fun when that happens. The rest of my fellow Guest Participants are full of serious design talents and I know if you love design you will enjoy all the hard work and design fabulous-ness that can be found in each of their “Reveal” posts – so be sure and browse to your heart’s content!! The beginning of the reveal- with the rest to come! Thanks so much for following along! I appreciate all your comments and support! One Room Challenge, Spring 2018 Week 5 and Stuff is Happening!! One Room Challenge-Fall 2018 ~ Here We Go Again! One Room Challenge-Spring 2019 ~ Loft Retreat Week 3 – Hitting the Halfway Mark! 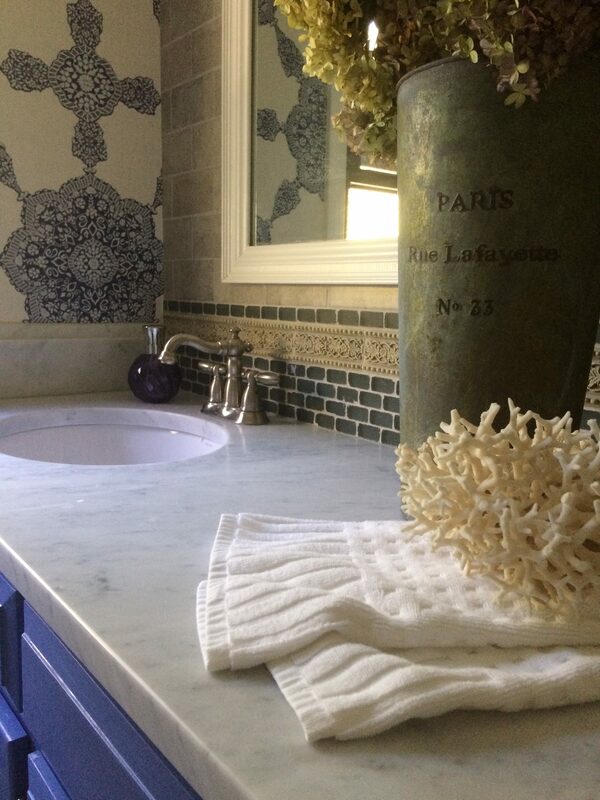 © 2014-2019 Meredith Bohn Interior Design. All rights reserved.